A fallen corporal who is one of two members of the Corps to receive the Medal of Honor for heroism in Iraq and Afghanistan, will have a building named in his honor aboard the base where Marines conduct their predeployment training. A ceremony for the dedication of the Cpl. Jason L. Dunham Hall will be held on Feb. 18, at Marine Corps Air Ground Combat Center Twentynine Palms, Calif., according to a news release. “The Combat Center dedicates this facility to one of its own Marines, who paid the ultimate sacrifice, saving the lives of his fellow Marines, while deployed to Afghanistan with 3rd Battalion, 7th Marine Regiment,” the release states. Dunham was the first Marine to be awarded the Medal of Honor after the wars began in Afghanistan and Iraq. He is credited with saving the lives of at least two fellow Marines during a 2004 deployment to Iraq, according to his award citation. Dunham’s squad was conducting a reconnaissance mission in the town of Karabilah when they heard rocket-propelled grenade and small arms fire a little more than a mile away. He led his team towards the enemy, and at the same time provided fire support to their battalion commander’s convoy, which had been ambushed as it was traveling to Camp Husaybah. Dunham and his squad began receiving enemy fire, and he ordered them to dismount their vehicles, leading one of his fire teams on foot for several blocks. They found seven Iraqi vehicles attempting to leave, but he and his team stopped them to search for weapons. As they approached the vehicles, an insurgent jumped out and attacked Dunham. The Marine wrestled him to the ground, and as he did, noticed the insurgent throwing a grenade. He alerted his fellow Marines, and without hesitation covered the grenade with his body and helmet, bearing the brunt of the explosion and saving his comrades. Dunham died from his wounds eight days later. His family was presented with his Medal of Honor in January 2007 by President George Bush. He was the first Marine to be awarded the Medal of Honor in more than 30 years and the second service member to receive the nation’s highest award for valor during the wars in Iraq and Afghanistan. 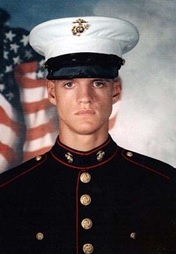 The Navy’s Destroyer Jason Dunham is also named in the Marine’s honor. I knew Jason in Kings Bay, GA. Hard to believe it’s coming up on ten years. Rest in peace, Jason. God bless Jason and God Bless America!!! Bravery–it was without hesitation-without appearing to consider another option, that he so willingly gave his life to defend his fellow man. It breaks my heart with immense pride and sorrow at the same time.